Prepare yourself for the feeling of more water with H2Okinetic Technology.. H2Okinetic. provides a truly better shower experience. The warm, drenching water coverage is the result of a denser water pattern and larger droplets that retain their heat longer to soothe and revitalize. Delta. is committed to supporting water conservation around the globe and has been recognized as WaterSense. Manufacturer Partner of the Year in 2011, 2013, and 2014. Upgrading to a new Delta. shower head is a great weekend DIY project. No special tools required. Innovative Pause feature allows you to conserve water while lathering up. As an enhancement to a custom shower, this H2Okinetic Adjustable Body Spray has the power to transform an experience from ordinary to extraordinary. This body jet features Delta's proprietary H2Okinetic Technology, which uses larger water droplets, coupled with a dense water pattern, resulting in drenching water coverage designed to soothe, comfort, stimulate or revitalize all while using less water than a standard body jet. Delta. is committed to supporting water conservation around the globe and has been recognized as WaterSense. Manufacturer Partner. WaterSense labeled faucet uses at least 20% less water than the industry standard without compromising performance. Upgrading to a new Delta. shower head is a great weekend DIY project. No special tools required. Linden Monitor 17 Series Shower with In2ition Two-in-One Shower, Chrome The In2ition shower features a detachable handshower, which can run separately from or simultaneously with the showerhead, giving you the warmth and flexibility of two streams of water at once. Enjoy the comfort of water streaming from the showerhead position, while the handshower offers the flexibility to accomplish other tasks, such as bathing your children; washing your pet; and keeping your shower clean. When you're finished, simply slip the handshower back into place on the showerhead. 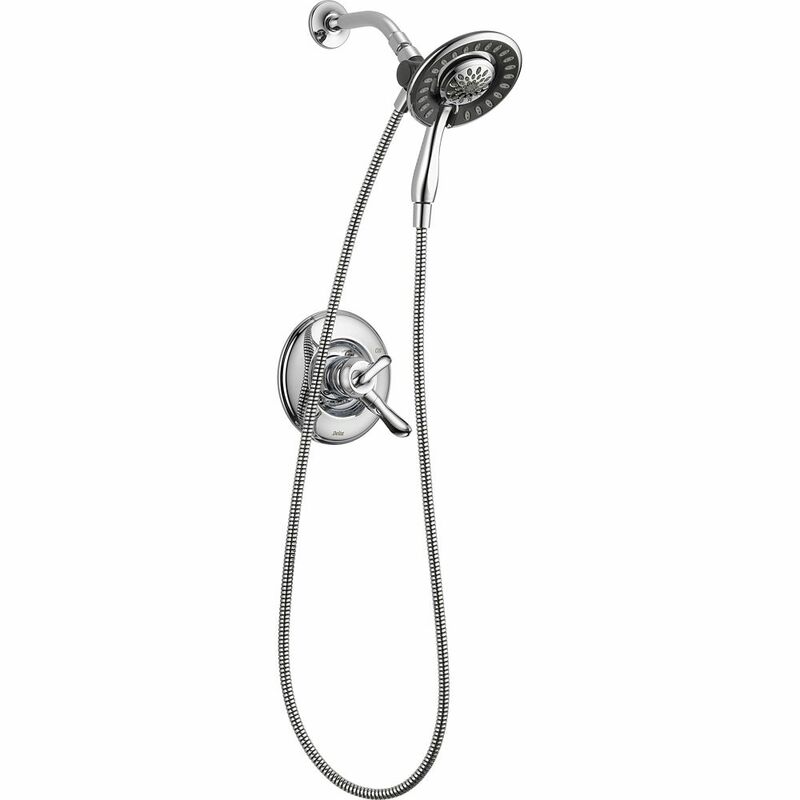 Linden Monitor 17 Series Shower with In2ition Two-in-One Shower, Chrome is rated 3.9 out of 5 by 46. Rated 4 out of 5 by DPatel from Leaking & no force Bought the shower recently, and was really looking forward to it, but unfortunately, it's not working as its suppose to be. Rated 3 out of 5 by CMHO from Acceptable Bought it for the look. Performance is eh. Very low pressure which I don’t mind because I have no hair on my head. Luckily it’s my shower and not my wife’s. She has a full head of hair and this thing would take forever to rinse. Also, the hot/cold setting switch is shaky/loose. Unfortunately, can’t try before buying. Installed by a professional (not by myself). Rated 1 out of 5 by Car from Cheap plastic parts. Hard to remove and put back shower head. I will be returning. Cheap plastic parts. Hard to remove and put back shower head. I will be returning. Rated 4 out of 5 by Chuck from We are happy with this product. The hose was very stiff! We had to run hot water through it to ... We are happy with this product. The hose was very stiff! We had to run hot water through it to soften it. Rated 1 out of 5 by ajdoval from Faulty parts Both the diversion switches malfunctioned. The one on the shower head fell off after minimal use. It can be pushed back on, but is not very secure. The one on the handheld shower gradually became very stiff until now it won't turn; the last attempt to turn it resulted in the knob breaking off (plastic!). Rated 2 out of 5 by HomeDepotCustomer from The removal hand held shower head falls out of the... The removal hand held shower head falls out of the holder if you bump the hose while showering. Only thing positive is once you set the hot/cold setting you no longer have to adjust. Just turn the shower on and you have the correct setting. Rated 5 out of 5 by ThornyBrush from This item is exactly what I wanted. Was fairly easy to install, and the price was GREAT! This item is exactly what I wanted. Was fairly easy to install, and the price was GREAT!